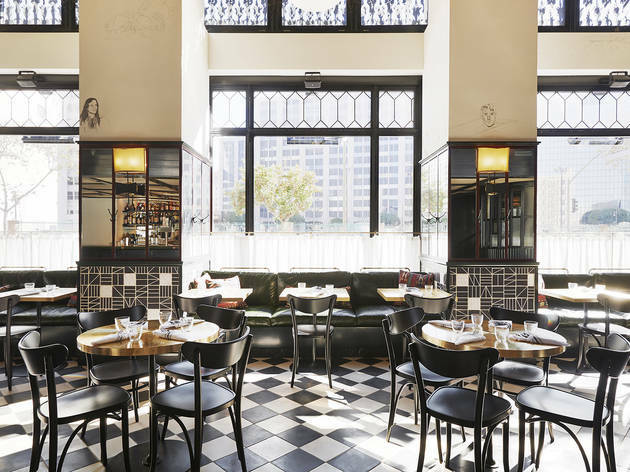 As is often the case, the buzz that came with the opening of the Ace Hotel Downtown was almost as impressive as the revitalized building itself. The restored United Artists Theatre—a dazzling work of art—and the hotel's rooftop lounge were the primary points of interest, but part of the buzz, too, went to L.A. Chapter, the ground floor restaurant that resembles a Parisian bistro with a black-and-white tiled floor and pencil etchings decorating the walls. Also chic: the diners, comprised of fashionable men with long hair and women in hats who sit in the most photogenic of groups. The menu is just as exciting to study, and employs unique mash-ups like licorice with duck and pistachio puree with octopus. Yet while the theater and lounge are, so far, deserving of all their praise, the restaurant is another story—uneven at times in both food and service, it is running the risk of becoming just another hotel restaurant. If you were to return to L.A. Chapter, it would be for the appetizers. Whether this is a sign that the kitchen does best with small plates or that they cater to the nibblers of LA, it is uncertain, but our meal opened with a bang: a grilled octopus, drizzled in olive pistachio puree with leaves of radicchio avoided the oft-overcooked fate of so many tentacled starters. We cleaned out the house made ricotta, which is beautifully presented with fresh figs and a ball of sticky honeycomb; scooped onto grilled fruit bread, it's a refreshing alternative to the standard cheese plate. 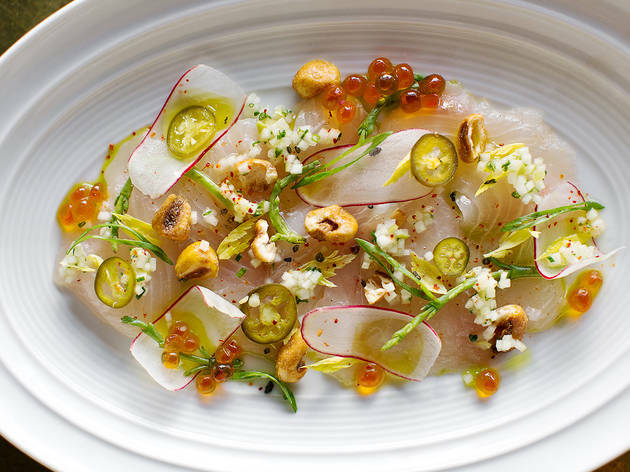 We would also return for the Amberjack crudo, a seemingly sparse plate but one that packs in some intense flavor combinations—salty crudo with spicy ginger, sweet green apple and pickled serrano, and a sprinkling of corn nuts (one curiosity: snack items, like the corn nuts and fingerling chips, were featured throughout the majority of our dishes). And then, amidst some sporadic service and three attempts at procuring a decent glass of wine, our entrées arrived and the narrative changed considerably. 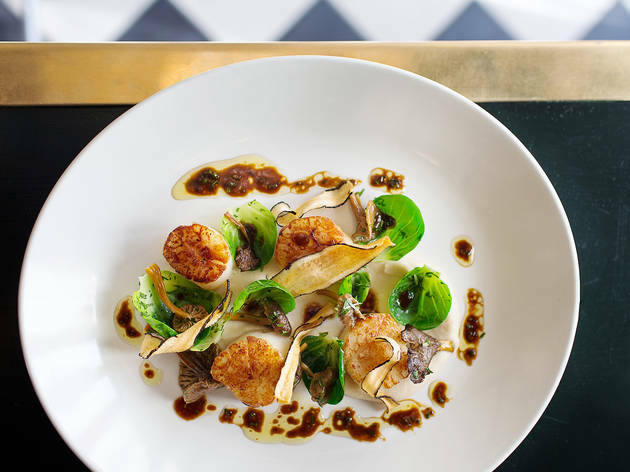 While the sea scallops on a bed of Brussels leaves were fine—really, just fine, garnished with buttery yellowfoot mushrooms and (again!) those chips—a bowl of lemongrass rabbit ragu proved to be surprisingly dull. The rabbit, stewed and shredded above creamy semolina and borlotti beans, was tender, but the rest—well, we kept shrugging our shoulders at its blandness, as if to say, "This is it?" Spoiler alert: Yes, that was it. Does a comforting dessert make up for lackluster main dishes? We felt somewhat vindicated with a gooey plate of bread pudding, but it is much harder to find fault in moist bread dripping with chocolate and hazelnut sauce (and accompanied by unexpected chunks of freeze-dried ice cream). It is easier to lament a cappuccino that arrives after the check, despite being ordered with dessert, but at that point it is also too late to really care. What to Eat: The grilled octopus ($16). The house made ricotta ($11). 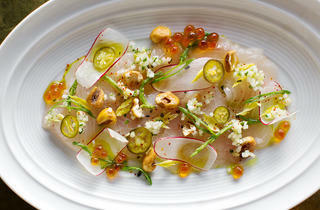 The Amberjack crudo ($13). 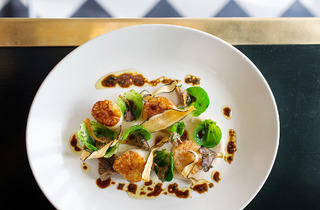 The seared sea scallops ($28). 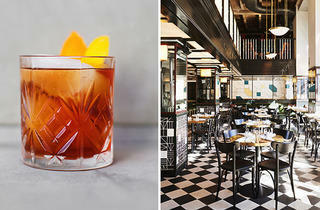 What to Drink: There is a lengthy and, at least in theory, varied cocktail list at L.A. Chapter. So what happens when you order two different drinks—one, The Ghostlight ($13), featuring rye, cardomom-cinnamon syrup, angostura and cherry bark bitters; another, Rhymes with Orange ($13), boasting blended scotch, ferrand dry curaco, crème de cacao and mole bitters—and they taste, more or less, the same? Did the bartender make a mistake, or was it pure laziness? To be fair, both were good—we just wished the drinks' different ingredients could have resulted in equally diverse cocktails. Where to Sit: The restaurant is small, which makes the center tables an obstacle for rushed waiters. Sit by the window or in the upstairs mezzanine, where you can both people watch and avoid the occasional jostling. 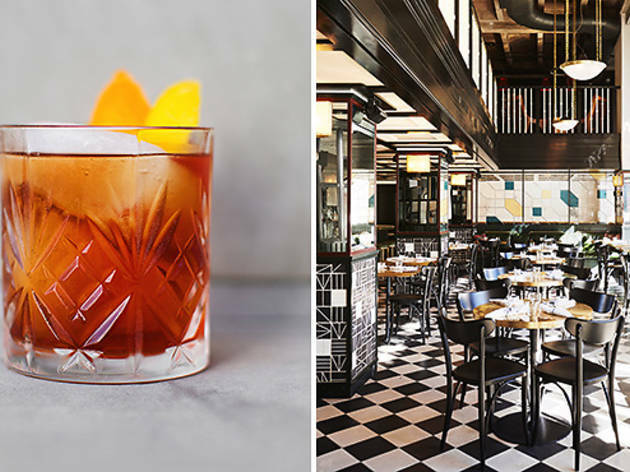 Conversation Piece: L.A. Chapter is fashioned after Ken Addington's Five Leaves in Brooklyn; some of the NY restaurant's menu items have trickled onto the LA offshoot. This hotel restaurant and bar certainly doesn't feel like it's in a hotel. It's a great spot for a bite and a drink before heading out if you are staying at the hotel (or even if you're not and just hanging out in the neighborhood). 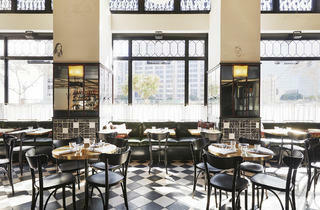 LA chapter is located within The Ace hotel and offers a good variety of American cuisine. Their plates are on the smaller side so I suggest ordering at least two plates! For brunch their avocado toast is very good and also their cauliflower soup, which happens to be vegan!